Take advantage of our 10% off sale by ordering today! This won't last long so act fas!. Our selection of Tungsten Rings are the very finest available. Tungsten Wedding Bands make excellent wedding rings as they come in a variety of shapes, sizes and colors. Not only are they great for Men but if you are looking for a Women's Wedding Band it's possible that the scratch resistant properties of Tungsten Rings will make an excellent choice for her bridal band. If you are looking for more than one ring, we recommend our Tungsten Ring Sets as these are offered at a discount when sold as a Cheap Wedding Ring Set! We have many choices in this category and in addition to offering great products at stellar prices, our rings are backed by the finest warranty in the industry. Your ring will come with a lifetime warranty that will cover sizing (in addition to many other issue that arise happen to your ring, including being removed in a medical emergency) which is very important as sizing can not be done to Tungsten Wedding Bands via traditional methods. To browse our Tungsten Collection, click here. If you are looking for something on the 'lighter' side then it is possible Titanium Wedding Bands might be the choice for you. Our selection of Titanium Rings are again a great choice for both a Mens Ring or a Womens Rings. In addition to being just flat out stylish and attractive they are more scratch resistant than traditional metals such as gold or silver, and are extremely light weight! This light weight choice is great, especially for the man who is sure that he isn't a 'jewelry guy' and doesn't want something heavy on his finger. Putting on one of these light weight, hypo allergenic Titanium Rings is like wrapping your finger with something as light as a feather. In addition to being light weight and scratch resistant these rings are also offered as His and Her Titanium Ring Sets and can be custom engraved to your liking! To browse our Titanium Collection, click here. Cobalt Wedding Rings are one of the newest trends on the contemporary or alternative metal side of jewelry production. Cobalt Rings, also known as Cobalt Chrome Rings, are have some very distinct advantages over some metals such as Tungsten, and Titanium. Cobalt Chrome is a hypoallergenic metal that is more scratch resistant than most metals (including Titanium), is naturally white, for that platinum look, and is also shatter proof. These are a great choice as wedding jewelry for Mens or Womens Cobalt Chrome Wedding Bands but like all of our selections they are not limited to just being wedding rings, they are great as part of your everyday fashion arsenal. To browse our Cobalt Collection click here. When affordability and style are what matter - consider a Stainless Steel Wedding Band. Our Stainless Steel selection has been geared toward being highly customizable with much of this selection being engravable with both inside ring engraving, and outside ring engraving. For the ultimate Cheap Wedding Band, Stainless Steel is the way to go. They will last you for many years, make great Starter Wedding Rings and serve as an attractive reminder for that special occasion or special someone. Browse our Stainless Steel Collection, click here. Some people will agree that traditional is the way to go, especially when it comes to wedding jewelry. Gold Wedding Bands have been used for 1000's of years as a symbol of everlasting love between two people. As with all Wedding Rings the complete, closed circle is an appropriate representation of love that never ends. Gold is both valuable, and attractive, and is available in a variety of colors such as White Gold, Yellow Gold, and even Rose Gold has become very popular lately. Gold is also easier to work with than many of the contemporary metals that are available on today's market. Having either a Women's Gold Wedding Ring, or a Men's Gold Wedding Band makes it possible to walk into just about any jewelry shop in the world and have repair work done to it such as polishing or resizing. Of course Ring Ninja will always be available to service your gold ring, if this is the option you choose! To browse all of our Precious Metal collection, including available gold, silver, and platinum, click here. What do you think of the idea of Promise Rings? If you are looking for Couples Ring Sets or His and Hers Promise Rings you have come the right place! At Ring Ninja we do market most of our products as wedding rings, however all of our jewelry is incredible for everyday wear - and all of our products especially products like our His and Hers Tungsten Ring Sets and our His and Her Titanium Wedding Bands and even our affordably priced Cheap Wedding Ring Sets (and by cheap, we mean the same affordable, high quality options you've always gotten from Ring Ninja) are sure to look great on any one of your fingers! Browse our selection of Matching Wedding Band Sets, click here. In addition to all of our great rings, we also are known for our custom engraving services. Whether you need to have your ring engraved on the inside, or the outside we can handle the job. In addition to doing engraving in English, we do Custom Arabic Ring engraving, Custom Hebrew Ring Engraving, Custom Japanese Engraving, Custom Chinese Engraving, if you have your own designs we can often custom engraving those as well. For more details on our ring personalization and custom engraving services, click here. Looking for something for your wedding party? Need that last minute groomsman's gift or bridesmaid's gift? 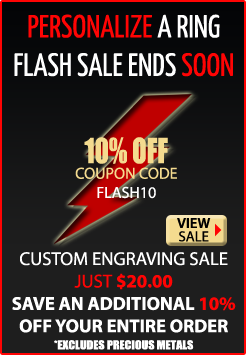 Check out our selection of Engravable Gifts. We have custom engraved flasks, knives, and even awards for you! These are great for honoring your wedding party, or great to give as gifts. We also sell jewelry gifts as well, and these can be found under various sections of our site such as the Tungsten Collection, or Titanium Collection, etc - things like pendants, bracelets, we even have gifts you can personalize with fingerprint engraving! To check for these types of gifts just peruse the site, or use the search bar - if you are looking for custom engraved wedding party gifts, check out our Engravable Gifts selection by clicking here. Thanks so much for taking the time to visit us here at Ring Ninja, and we hope that we have what you are looking for - and keep in mind that if we don't, we do custom jewelry creations for our customer all the time. If there are any questions that you'd like to have answered we invite you to leave us an email - we will generally respond within an hour during normal business hours. Also please feel free to try our live chat, check out our facebook page, or give us a call - we'd be happy to assist you!